Harold’s New York Deli, Edison, New Jersey- Scott and I ate here on a Friday night during a house- hunting trip to New Jersey. It’s next to a hotel near the business park where his new office is in Edison, right off the highway. As far as I’ve seen, it’s the only place to eat in Edison besides Dunkin’ Donuts and the only place I could almost reliably find from our hotel with out ending up on a divided highway in bumper to bumper traffic for an hour while the GPS indignantly and huffily re-calculates repeatedly. But I digress. The entrance hallway is flanked by the cashier’s booth on one side and a wall of glass fronted refrigerator cases on the other. The cases are full of cakes- layer and cheese on a scale that makes me feel Lilliputian. Seriously huge, the layer cakes are six layers tall in commercial sized cake pans and the cheesecakes are probably six inches deep by eighteen inches across. Scott took me past the hostess stand for a quick look at the pickle bar, a twelve foot buffet with sliced bread, rolls and pickles- sauerkraut, sour, half sour, kosher dill, health salad (oh the irony!) pickled tomatoes, hot cherry pickled peppers, hot garlic dill chips, and maybe a couple more that I can’t remember. We went back to the hostess and she threaded us through several dining rooms of hearty eaters to a long table near the back of the restaurant. The menu recommended sharing sandwiches between two people for a large or up to four people for the extra-large. We ordered a Reuben with pastrami, sized large comes with pickle bar and we order a couple of Dr. Brown sodas. Walking back through the restaurant to the pickle bar, the scale of the food on the tables I pass begins to really sink in- these are massive sandwiches! I see a sandwich with a half a head of iceberg lettuce perched on top, dwarfed by the huge pile of meat underneath. We get an assortment of pickles to try, and they are really good- the sauerkraut has that bitter tang of really fermented cabbage, the pickles are each distinctive in flavor and texture. I really like the tomato and the half sour. Our sandwich arrives, open-faced and roughly the size of a roast chicken, covered with melted cheese and accompanied by spicy mustard and Russian dressing on the side. When we dig in and start piling it onto our plates, it’s a layer of swiss (?) 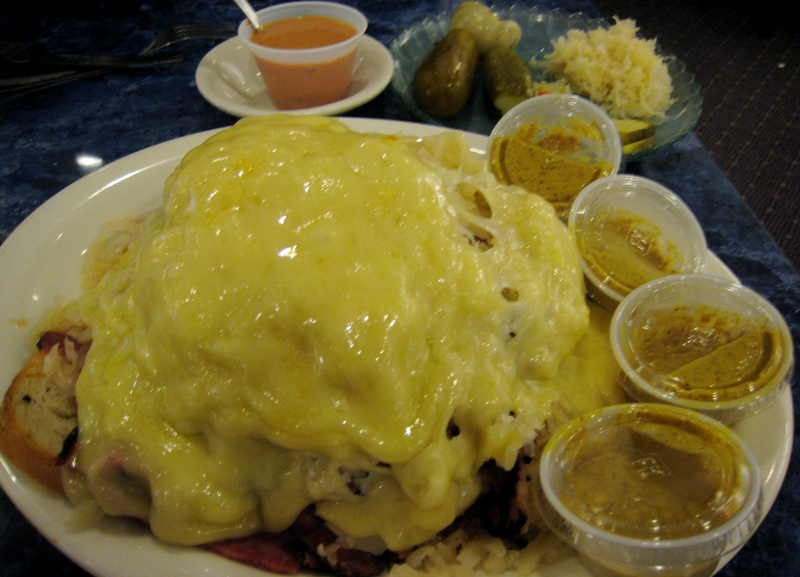 cheese, a pile of the great sauerkraut and a moist pink pile of pastrami on top of dressing and a slice of bread. It’s the best pastrami I have ever had- juicy and flavorful with just the right amount of fat throughout each slice. The peppery black layer on the outside is delicious. There is easily a pound and a half of meat on the plate. My cream soda and the pickles cut through some of the richness, but really, that’s a losing battle. I wonder out loud if Scott’s vegan colleague breaks out in hives just driving past the restaurant. Meanwhile, a couple of guys sit at the opposite end of our table- clearly local based on the accent. They order the “romany” steak which reminded me of the grocery list for King Solomon’s household when it arrived along with about a quart of mashed potatoes. When I ask what it is and then laugh spontaneously at the absurdity of it all, they go into full swing. They remark how ridiculous it is- disgusting, really- as they dig in. Got any friends in the area, they say, call them and have them help us eat this. One says he’s going to take a baby aspirin as soon as the meal is over, the other says he’s got his doctor on speed dial and sets his cell phone on the table next to his plate. Their wives will no longer come here with them, they say, they’ll have stroke from all the salt in the pickles. It’s pure theatre and they play it to perfection. We made it through about half of our sandwich before calling it quits and turned down the offer of dessert, no thanks, no two-pound slice of cake for me tonight, thank you. A couple more groups come past us as we’re paying the cashier, and the stereotypical bleach-blond cotton candy haired, leopard clothed, perma-tanned, gold encrusted 65-year-old Jersey matron cackles past us saying ”everything here is king-soized!” Her compadres are outside finishing their cigarettes and gossiping.